I loved the card I saw at leadership that looked similar to this. I added my own flavor since I only had a poorly lit Iphone photo of the original. This was easy and fun card to do at February and March Workshops as folks got to play a bit with their own embellishments. Plus, the whole card took very little time! 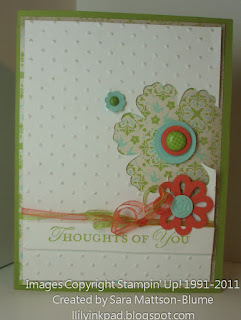 Love this card and your version is fabulous! I am going to miss this paper so much!! I agree with Yapha, both loving the card and missing the paper! So beautiful! I love that punched out look. So pretty, Sara! I love the cards I've seen like this. A nice frame for the paper!